India has a wide variety of beard trimmers and shavers. Just a few years ago, it was very hard to find a decent electric shaver for men. The common or street term for an electric shaving machine used to be ‘zero machine for shaving’. It’s a mystery on how that term describes a shaving machine, but nevertheless, electric shavers are hear to stay. Important thing to note is that electric shavers and electric trimmers are different devices. An electric shaver for men is a device for getting a clean shave. On the other hand, a beard trimmer is a trimmer, not a shaver. A beard trimmer will help you get a bearded look and help you maintain that look. 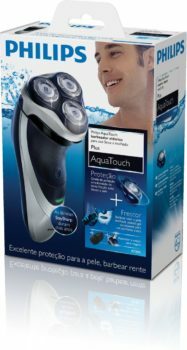 If you are looking for an electric shaver for men but you have been using traditional shaving methods since a long time, then you might feel very uncomfortable in using electric shavers for the first time. Once you buy an electric shaver, it is recommended that you do not use dry shave for the first 10-15 times. Use a wet shave for the first 10 times and use a good after shave. Your skin will not be used to the electric shavers and some redness is normal. After using a wet shave 10 times, your skin will adjust to the electric shaver and then you can use a wet shave or a dry shave as per your convenience. Today we will review the best electric shavers for men. 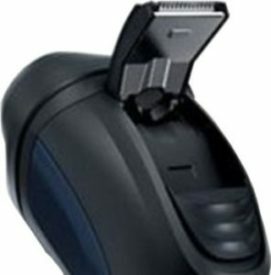 We will share detailed review of all electric shavers. 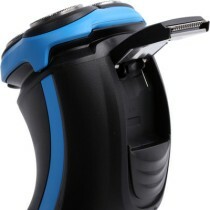 We will also share electric shaver prices, charging times and other factors that make a good electric shaver. After that we will share our pick for best shaver in India. 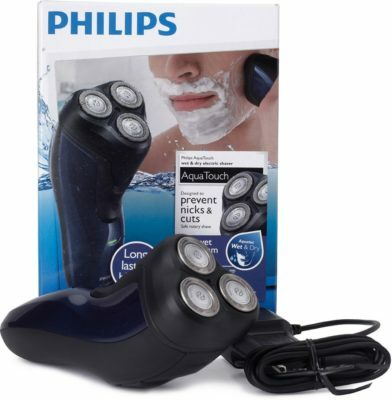 The Philips AquaTouch S5050/06 is a semi premium electric shaver for men. 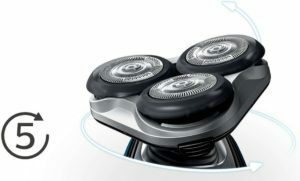 The Philips AquaTouch S5050/06 is a round head cordless electric shaver with 3 shave heads. The Philips AquaTouch S5050/06 is a wet and dry shaver. So you can shave dry or use shaving foam or cream of your choice. The Philips electric shaver is also waterproof. You can comfortably use it in the shower and clean it later. It features 3 ComfortCut Blades on its head which can move in 5 directions independently. This results is smooth shaves even at troublesome areas like jawline. The operation for Philips S5050 is also completely cordless. 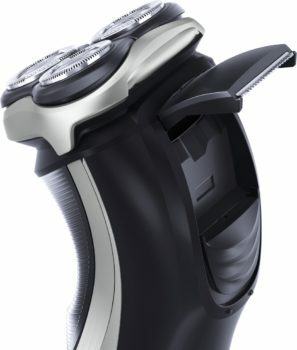 The electric shaver takes 8 hours to completely charge and can be used for a stretch of 30 mins. That is good to complete 3-5 shaves. It also features a handy LED light that tells you the charging status. To trim your sideburns and mustache, the Philips AquaTouch S5050 has a built in SmartClick Precision Trimmer. The trimmer is pop up based and can trim hair with ease. Philips AquaTouch S5050 comes with a 2 year limited warranty and the warranty can be extended for another year after registering your shaver online. 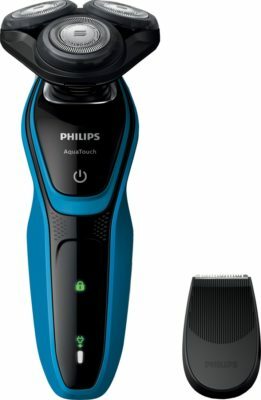 Philips AquaTouch AT756 is a mid range electric shaver for men. 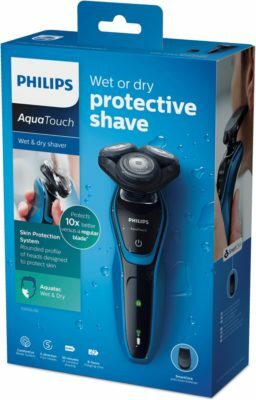 Philips AquaTouch AT756 is a wet and dry shaver. You can shave dry or use shaving foam or shaving cream with is as well. The AquaTouch AT756 has 3 blades with self adjusting feature. The blade’s angles adjust according to the position of shaving. Obviously the AT756 is completely waterproof as well. 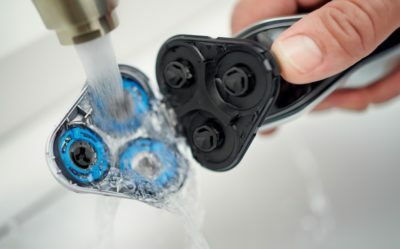 You can easily clean the blades under running water. The AT756 shaver is also completely cordless and you can use it after charging the internal battery. All Philips shavers including the AquaTouch AT756 have low friction roundheads. That means you will get a close shave without rashes or itching. The Philips AquaTouch AT756 needs 8 hours of charge time and can be used for 40 mins per charge. That means you can easily shave 4-5 times without recharging. The AquaTouch AT756 also has a pop up trimmer which you can use to maintain your mustache or sideburns. The AquaTouch AT756 also features a LED light on the front which will helps know the charge status. The LED shows different colors when battery is charged and battery is low. This way you will know if the shaver needs to be charged before use. Philips AquaTouch AT756 has a 2 year warranty which can be extended over 1 more year when you register your shaver online. 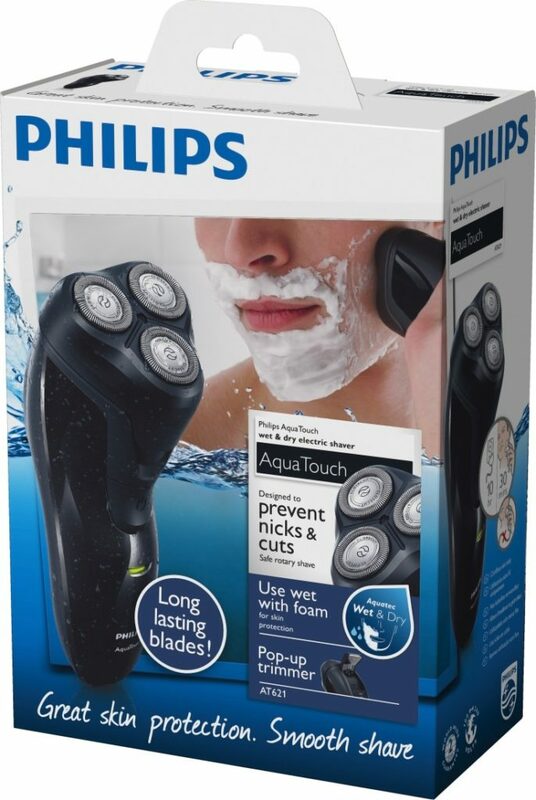 The Philips AquaTouch Plus AT890/16 is a premium electric shaver for men featuring 3 blades. Like other AquaTouch shavers, the AT890/16 is also water proof and also a wet and dry shaver. You can easily use it in the shower and rinse it with water. The AT890/16 has dual precision blades which have a super lift and cut action. That means that 3 shaving heads each of have 2 blades. The blade that is farther cuts the thick beard and the closer beard cuts the small facial hair. This helps achieve a smooth and clean shave every time. The Philips AT890/16 blades also have dynamic contour response. The blades will adjust their angles based on your facial features. This helps shave in tough spots like jawline. 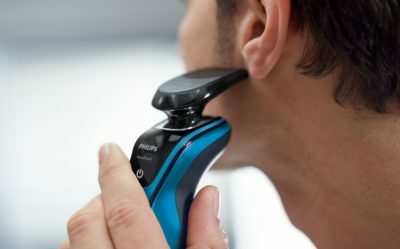 The Philips AT890/16 charges in only 1 hour and can be used for 50 minutes for shaving. That means you can easily shave 5-8 times on a single charge. In case of emergency, the Philips AT890/16 also has a quick charge feature which will charge the shaver for 1 charge in just 3 minutes. As expected, you also get a pop up trimmer with the AT890 which can be used to maintain your mustache or sideburns. 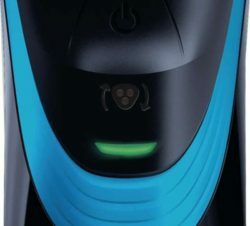 THe Philips AT890/16 has a 2 year warranty which can be extended to another year when you register your shaver. 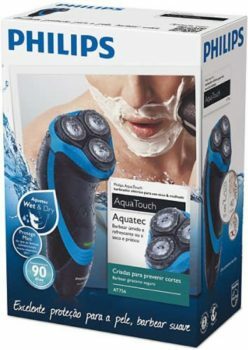 The Philips AquaTouch AT891 is another semi premium electric shaver for men. The Philips AquaTouch AT891 is slightly upgraded version of the AT890 and has slight internal improvements. The rest of features are the same as AT890 as discussed. The Philips AquaTouch AT891 is a wet a cordless, 100% waterproof wet and dry shaver. The electric shaver has 3 shave heads can gives a close shave. You can charge the AquaTouch AT891 in just 1 hour and then it can be used for continously 50 minutes for shaving. That is good for 6-8 shaves. The Philips AquaTouch AT891 also has built in trimmer to trim your sideburns and mustache. The Philips AquaTouch AT891 has a 2 year worldwide warranty. The Philips AquaTouch S5420/06 is a premium electric shaver for men. The S5420/06 is a cordless, waterproof and wet and dry shaver. The Aquatouch S5420/06 features 3 shave heads and have multiple blades in them. The blades have 5 directional shaving system which helps achieve a smooth and close shave. The Philips AquaTouch requires only 60 minutes of charging time and you can use the shaver for 45 minutes after that. That is good enough for 5-6 shaves at least. The Philips AquaTouch S5420/06 also has a pop up trimmer which can be used to trim your mustache and sideburns. The AquaTouch S5420 has a 2 year India wide warranty. You can use the electric shaver with peace of mind. The Philips AquaTouch AT620/14 is an economical electric shaver for men. The AquaTouch AT620/14 is a 100% waterproof, cordless and wet and dry shaver. 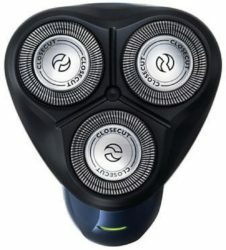 The AquaTouch AT620/14 has 3 shave heads with CloseCut blades. This means you will have a smooth and close shave. You need to charge the AquaTouch AT620/14 for 10 hours for a complete charge. After a full charge you can use the electric shaver for 30 minutes at a stretch. The AT620/14 also has a full width pop up trimmer which you can use to trim your sideburns and mustache. The Philips AquaTouch AT620/14 comes with a 2 year warranty which is applicable all across India. 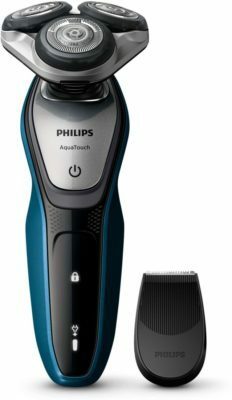 The Philips AquaTouch AT610/14 another affordable electric shaver for men. The features of the AquaTouch AT610/14 are similar to the AT620 discussed above but has a few limitations. Lets look at the features. 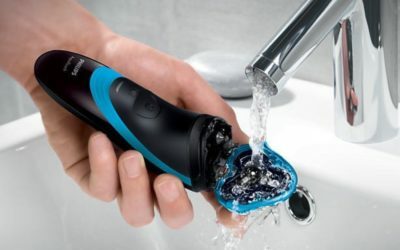 The AquaTouch AT610/14 is a cordless, waterproof, wet and dry shaver for men. The shaver has 3 shaving heads with angle adjusting blades. The angle adjusting helps shave clean in areas that are difficult to shave, like the jawline. The AquaTouch AT610/14 can be used for 30 mins continuously after 10 hours of charging. One negative thing about the AquaTouch AT610/14 is that it does not have a trimmer. If you want a trimmer then its recommended that you purchase the AT620 discussed above. However you still get 2 years warranty on the Aquatouch AT610. The Philips AquaTouch AT621 is a mid range electric shaver for men. The AquaTouch AT621 is cordless, waterproof and a wet and dry shaver. The shaver has 3 shaving heads which offers close and clean shave. The AquaTouch AT621 can be used for 30 minutes at a stretch for a 10 hour charge time. The AT621 also has a trimmer which you can use to trim and maintain your sideburns and mustache. 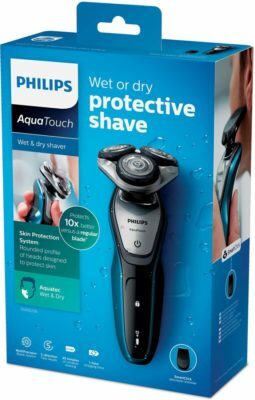 The Philips Aquatouch AT621 has a 2 year warranty which can be extended to 3 years after online registration of your shaver. Best I have ever used is the electric shaver Karmin T7.